Today is my Grand daughter Jasmine's B-day!!!!!!!!! This is a side view. I used 3D foam. Here you can see that I did try to create a Leprechaun, but opted for the Shamrock instead. My Leprechaun is hiding! These Basic Grey are the greatest little magnets (much better than velcro, in my opinion) to use in any box or bag you want to close securely. The magnet is pretty strong as well as the adhesive on them. Each package contains the + plus and - minus and they sell them in two sizes. I used the small ones. You can interpret this challenge anyway you like, however you must create a new project for this challenge! 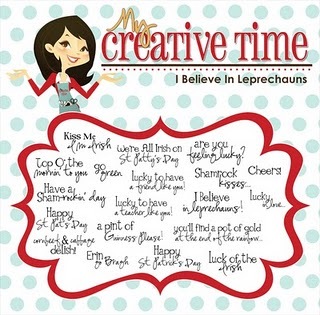 I BELIEVE IN LEPRECHAUNS STAMP SET!! Be sure to enter your project over at the Creative Cutter Room! Stop by the Creative Design Team Members for more inspiration!